ARLINGTON, VA -- Have you ever heard of ... Kong? One of Hollywood's most famous questions was answered with a resounding roar Sunday as versions old and new of the great ape saga took an unprecedented seven top spots in the Fourth Annual Rondo Hatton Classic Horror Awards. 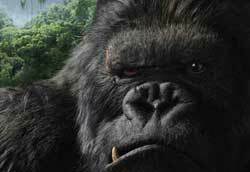 King Kong, Peter Jackson's $200 million remake of the Depression Era classic, was named Best Genre Movie of 2005 in the online survey of more than 1,260 horror fans, pros and enthusiasts from around the world. Jackson's epic was joined in the chest beating by the original King Kong, released on DVD for the first time only last year. The 1933 stop-motion classic swept the video awards, taking Best Classic Horror DVD, Best Film Restoration and Best DVD Extra by huge margins. The "extra'' was a riveting six-minute sequence in which modern animators recreated the film's infamous spider scene, which was cut from the original Kong because it was deemed too horrifying. 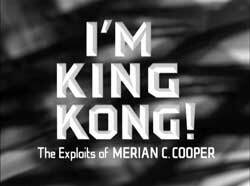 In addition, I'm King Kong, a documentary shown on TCM about Merian C. Cooper, the man who made the film, won for Best TV Presentation. A story in Starlog Magazine by Tom Weaver and Bob Burns, a Hollywood collector who owns the original model of Kong, was voted Best Article. And a painting of Kong by Lorraine Bush for Monster Bash magazine was named Best Cover. Kong was so overpowering that in one category, Best Restoration, the reconstruction of the original film drew 528 votes, by far the largest number ever received by any Rondo nominee in the four years of the award program's existence. MGM's million-dollar upgrade of The Wizard of Oz was a distant second, drawing less than 180 votes. 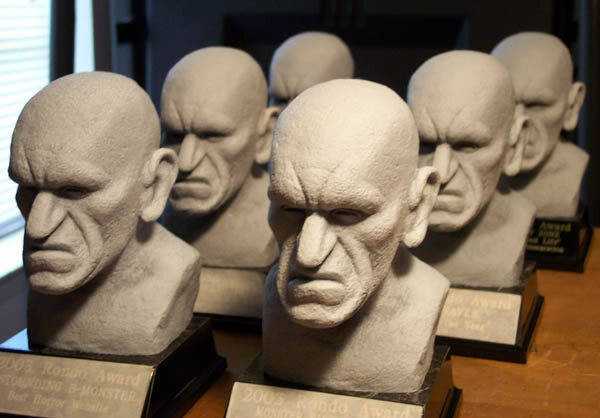 The Rondo award program, named after 1940s character actor Rondo Hatton, is an email survey of the classic horror fan community sponsored by the Classic Horror Film Board. Now in its fourth year, the five weeks of balloting in 23 categories were solicited at websites, online discussion groups and through mailings. 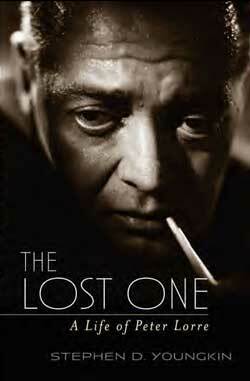 -- Best Book of 2005: The Lost One: A Life of Peter Lorre, by Stephen D. Youngkin, a revealing look at the iconic character actor who defined melodrama and menace from the silent era to the 60s. The book topped a crowded field of works, including Crystal Lake Memories, a history of the Friday the 13th films by Peter M. Bracke, Earth vs. the Sci-Fi Filmmakers, a collection of interviews by Weaver, and Beating the Devil: The Making of Night of the Demon, by English writer Tony Earnshaw. -- Best DVD Commentary went to the Unholy Trio of Joe Dante, Bob Burns and Bill Warren, whose work drew nearly 300 votes for their joint commentary about the special effects and production of the 1953 version of War of the Worlds. -- Best Independent Film went to Monster Kid Home Movies, a collection of 8mm homemade horror shorts made by kids and young fans in the 1950s, 60 and 70s. The now-grown filmmakers, including director Bob Tinnell and Disney artist Frank Dietz, provided narrations for the amateur films which were restored and color-corrected after years of neglect and deterioration. The project was a labor of love by Cincinnati horror fan Joe Busam, who was also named Monster Kid of the Year for his efforts. -- Magazine of the Year: Video Watchdog, edited by Tim and Donna Lucas, won top magazine honors for a fourth straight year despite a reduced schedule as Lucas completes a book on horror director Mario Bava. The top runner-up was Monsters from the Vault, separated from Watchdog by only 16 votes, followed by Fangoria, Rue Morgue, Scary Monsters and Filmfax. -- Writer of the Year: Tom Weaver, a prodigious interviewer of near-forgotten B-movie figures won best writer honors for the fourth straight year. Although a write-in-only category, Weaver was named by almost 100 fans, topping Lucas by a small margin. There also was a strong write-in effort for Creature of the Black Lagoon documentarian Sam Borowski. 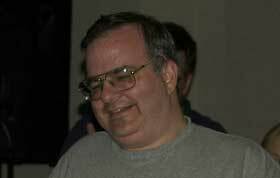 Other top writers included Greg Mank and Bill Cooke. -- Best Convention: The Monster Bash, a family-friendly gathering of monster fans in Pittsburgh won the honor for the third time, beating out last year's winner, Chiller, a mega-event held in New Jersey and the up-and-coming WonderFest, a model-building and fantasy show in Louisville. -- Best Website went to Nashville horror host Dr. Gangrene, whose Chiller Cinema site and TV show is a horror landmark in Tennessee. His show is now seen on Ch. 58 in the region. The top website runner-up was the Astounding B-Monster, a past Rondo winner. 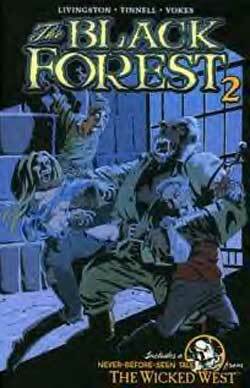 -- Best Horror Comic went for a second straight year to The Black Forest, a retelling of classic monster suspense set during World War I. The book is by Robert Tinnell, Todd Livingston and artist Neil Vokes. Runner-ups included Bruce Campbell's The Man With the Screaming Brain and Eric Powell's The Goon. 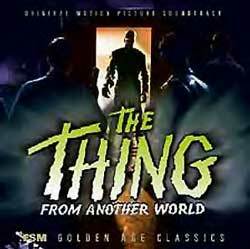 -- Best CD went to Film Score Monthly's recreation of Dmitri Tiomkin's chilling score for the 1951 science fiction classic, The Thing from Another World. The soundtrack narrowly edged out an album by a popular rock horror band from Nashville, the Creeping Cruds. 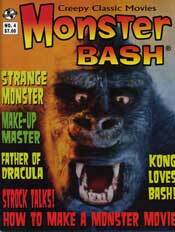 -- Best Cover was a razor-thin affair as well, with Lorraine Bush's painting of the original Kong for Monster Bash #4 edging out work by Joe Schovitz for Monsters from the Vault and Daniel Horne for Chiller Theatre magazines. -- Best Magazine Article was Kong-related as well as the popular team of Tom Weaver and Bob Burns recounted Burns' trip to the set of the Peter Jackson film in Starlog #343. A who's-who of talented writers were cited as well. 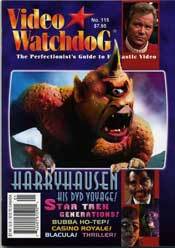 The next five selected were Bill Cooke for his piece on Universal films in Video Watchdog #118, Greg Mank's interview with Lionel Atwill's son in Monsters from the Vault #20, Frank Dello Stritto's account of a lost Lugosi Dracula performance in Cult Movies #41, and Jack Hagerty's analysis of Earth vs. the Flying Saucers in Filmfax #105. 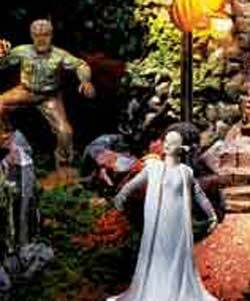 -- Best Model or Collectible was a bit unusual for the usually iconoclastic Rondo voters, going to Hawthorne Collections Universal Monster Village, a subscription-based assemblage of castles and monsters, including the Bride of Frankenstein and Dracula. -- Best DVD Company went to Warner Brothers, a reward for the restoration of the Kong film and other classic horrors, including a Val Lewton collection, in the past year. -- Count Alucard's Controversy of the Year category presented monster fans with several issue-oriented choices, including a dispute over an English magazine, The Dark Side and its reported use of reviews printed previously online, and consumer discontent with multi-movie DVDs, which do not play on all players. 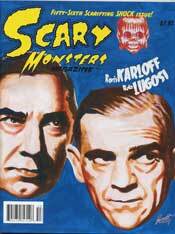 But voters expressed the most outrage over the fact that Boris Karloff's name was left off of Universal's Bela Lugosi Collection, even though Karloff co-stars in four of the five films. In all the DVD categories, Kong ruled supreme, drawing more than twice the votes of Lugosi and Lewton. Monster Kid Home Movies was strong as well, withstanding challanges in the voting from independent efforts such as Ray Harryhausen: The Early Years, The Call of Cthulhu, a new silent film based on work by H. P. Lovecraft; and Flesh and Blood, a documentary about the Hammer Films Studio. For TV presentation, the documentary on Cooper was challenged by ABC's spooky survival drama, Lost and another TCM documentary, Watch the Skies, about 50s scifi films. Also drawing significant support was "Homecoming,'' Joe Dante's anti-Iraq war episode of Showtime's Masters of Horror. For Best Genre Film, Jackson's Kong drew 100 votes more than runner-up, Batman Begins, which was followed by Sin City and The Devil's Rejects, a nihilistic look at "splatter'' films by Rob Zombie. -- Classic Most Needed on DVD: With many horror classics now available on DVD, attention turned to more obscure films. 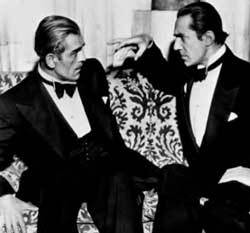 The Lugosi favorite, Island of Lost Souls topped the list. Fans also demanded several still-missing horrors from MGM, along with Universal 50s science fiction films, including The Incredible Shrinking Man and Tarantula. -- Monster Kid Hall of Fame: Seven new members were announced for induction into the Monster Kid Hall of Fame, which already includes Forrest J Ackerman, James Warren, Zacherley, Vampira, Bob and Kathy Burns, Ray Bradbury, Ray Harryhausen, Richard Gordon and the late Alex Gordon, Rick Baker and the late William K. Everson. -- Artists Basil Gogos and James Bama for their unforgettable paintings in the 1960s and beyond. Gogos' use of color and pathos on his covers for Famous Monsters turned black-and-white images into living, breathing monstrosities for a legion of then-young fans. And Bama's detailed paintings of the Universal monsters for the covers of the first Aurora monster models taught wide-eyed kids a respect for the genre and, more importantly, the actors behind the makeup, that lives on today. -- Film director Roger Corman, whose independent, brash and thought-provoking films of the 1950s remain vital, ironic and smart, and who paved the way for many of the fast-but-powerful techniques still used in moviemaking today. -- Musician Bobby "Boris" Pickett, whose rendition of the Monster Mash is still a Halloween perennial and who helped put the fun in monster fandom. It was, and is, a graveyard smash. -- Gary and Sue Svehla of Midnight Marquee, who over five decades of magazines, books, conventions and, recently, independent films, prove that there is always something new to find in the world of monsters and mayhem. They didn't invent monster magazines or conventions, but they showed what they could be. -- Richard Klemensen, whose ultimate Hammer magazine, Little Shoppe of Horrors, has been obsessive and definitive in every way for decades. From floor plans of Hammer sets to interviews with survivors of the Studio That Dripped Blood, Klemensen is one of the genre's most important chroniclers. 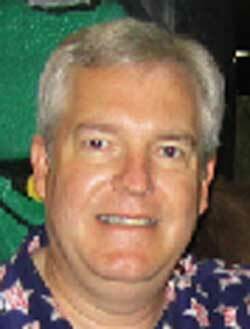 The awards announced Sunday will be followed by a series of presentations at conventions this summer, starting off the a Rondo ceremony at WonderFest in Louisville over Memorial Day. Many of the winners will receive Rondo Hatton statuettes, sculpted by Kerry Gammill (monsterkid.com), and cast by Tim M. Lindsey (tmlindsey.com). Voting for next year's winners will take place in January 2007. More information can be found at www.rondoaward.com, the official home of the Rondo awards. Wait! That's right here. Thanx everybody!! *This is record Rondo vote total. notably on the original Aurora model boxes). continues into a new age of digital filmmaking. fun to the monster craze. It remains a graveyard smash. line of magazines, books and conventions. the blood-red spirit and wit of the Hammer films alive and thriving. Forrest J Ackerman, James Warren, Bob and Kathy Burns, Vampira, Zacherley, Ray Bradbury, Ray Harryhausen, Richard Gordon, the late Alex Gordon, Rick Baker and the late William K. Everson. Full list of Rondo results available on request. -- Animal Icons: 'King Kong,' Animal Planet, 12/11/05. Documentary on the misty origins of Kong and other gorillas. -- Battlestar Galactica: '33.' SciFi Channel, 1/14/05. Fleet must jump into hyperspace every 33 minutes to avoid Cylon attack. -- Carnivale: 'Lincoln Highway.' HBO, 3.6.05. Mystic forces choose sides as the troubled troupe arrives in Wyoming. -- Enterprise: 'In a Mirror, Darkly' UPN, (two parts, 4/22 and 4/29/05). Echoing the alternate world of original Star Trek, a warlike Enterprise crew battles to dominate space. -- The 4400: 'Life Interrupted.' USA, 7/17/05. Tom is thrown into a parallel universe where no one has heard of the returnees. 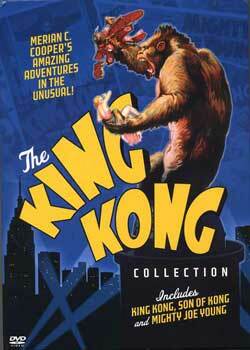 -- 'I'm King Kong: The Exploits of Merian C. Cooper.' TCM, 11/22/05. Documentary on the man behind the giant ape. -- Lost: 'The Other 48 Days.' ABC, 11/16/05. Rapid-fire vignettes trace the harrowing tale of a new set of survivors. -- Masters of Horror: 'Homecoming.' Showtime, 12/2/05. Slain U.S. soldiers rise from their coffins to confront those who sent them to Iraq. Joe Dante directed. -- Masters of Horror: 'Dreams in the Witch-House.' Showtime, 11/4/05. Stuart Gordon adapts H.P. Lovecraft's chiller about forbidden books and sacrifice. -- 'Midnight Movies: From the Margin to the Mainstream.' Encore, 8/5/05. Documentary looks at cult films that sparked the midnight movie craze of the 70s. -- 'Watch the Skies.' TCM, 7/5/05. Documentary examines how 1950s science fiction films reflected nervous times. -- CAT AND THE CANARY (1927) Cleaner print; slightly different take of the necklace-snatching. -- FRANKENSTEIN'S BLOODY TERROR: Widescreen; first 10 minutes restored in English. -- KING KONG (1933 original) Best available elements; censored scenes no longer dark. -- UGETSU: Dazzling print of classic Japanese ghost story. -- WIZARD OF OZ: Million-dollar digital Technicolor restoration. -- CANNIBAL HOLOCAUST: Includes version without animal cruelty. -- DANGER: DIABOLIK: Featurette, "Diabolik from Fumetti to Film' by Steve Bissette. -- FLESH EATERS: Missing footage uncovered. 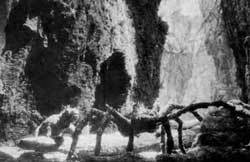 -- KING KONG (1933) Peter Jackson's crew uses stop-motion to recreate the lost spider scene. -- MYSTERIANS: Includes original storyboards. -- STAR TREK: FIRST CONTACT: Tribute to composer Jerry Goldsmith. -- Bob Burns, Joe Dante and Bill Warren: 1953 War of the Worlds. -- THE DEADLY SPAWN: Deluxe edition of 22-year-old independent includes commentaries. variety spoof, narrated by Vincent Price. Tom Weaver, Joe Busam and Richard Olsen. -- SILVER SCREAM: A musical sendup of King Kong, the Exorcist, Psycho and more. -- The Astounding B-Monster, by Marty Baumann. Collects best of this influential website. -- Beasts in the Cellar: The Exploitation Film Career of Tony Tenser, by John Hamilton. Looks at the influence of English horror producer. true story behind the different versions of Curse of the Demon. -- Crystal Lake Memories: The Complete History of Friday the 13th, by Peter M. Bracke. Every film and Jason examined in depth. Donnie Dunagan, Peter Graves and more. filmography was a lot more than horror. horror films in the 40s mirrored the isolation and fear of a society at war. look at the true wizard behind the machines in the lab. details about the man behind Kong and Cinerama. of horror's most haunting figures. and interviews analyze key films of recent decades. -- 'Lord of the Blind Dead: The Lost Interview with Armano Ossorio,'' by Trevor Barley and Chris Alexander. 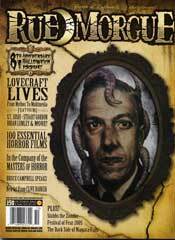 RUE MORGUE #49. -- 'They Did Science! 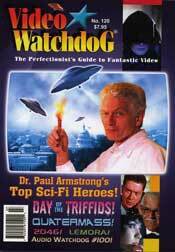 Dr. Paul Armstrong's Handy Guide to 50s Sci Fi Heroes,' by Larry Blamire, VIDEO WATCHDOG #120. Light-hearted look at the actors who fought the monsters. -- 'Good News! Good News! The Making of the Mysterians,' by Peter H. Brothers, G-FAN #73. Includes rare production documents and photos. -- 'Our Skull Island Odyssey,' by Bob Burns as told to Tom Weaver, STARLOG #343. 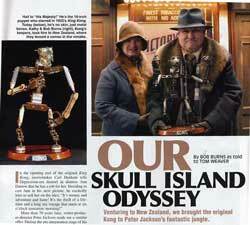 Recounting Bob's trip to New Zealand where he showed off the original Kong armature, met Peter Jackson and ended up in the movie. 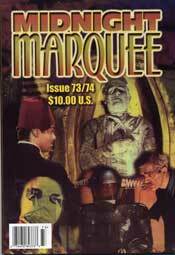 -- 'Universal's Other Monsters: A Legacy Written in Gauze, Claws and Tana Leaves,'' by Bill Cooke, VIDEO WATCHDOG #118. Examines film-by-film the Universal 'Legacy' collections. -- 'The Magic of Menzies,' by Vincent DiFate, FILMFAX #105-106. The genius behind Things to Come and Thief of Bagdad and Invaders from Mars. -- 'Crimes Against Continuity: 35 Monstrous Mistakes (or at least some irritating inconsistencies), as seen in Frankenstein,'' by Wray Ellis, FILMFAX #106. How did that third shovel get there? And other mysteries. -- 'Memories of Janet Ann,' by Dominic Florentino, SCARY MONSTERS #53. Meeting a monster icon, Janet Ann Gallow from Ghost of Frankenstein, at the Monster Bash. -- 'Edward and Obie: Reassessing the Partnership Between Two Dinosaur Men,' by William Fogg, FILMFAX #105. Revelatory look at the sometimes strained relations between Willis O'Brien and the Ed Nassour during the Beast of Hollow Mountain. -- 'Recollections of Simone,' by Roy Frumkes, SCARLET STREET #54. Comprehensive interview with iconic star of Cat People. -- 'The Complete Guide to 100 Alternative Horror Films,' by Rod Gudino, Dave Alexander and Jovanka Vuckovic, RUE MORGUE #50. From classics to moderns, films you might have missed. 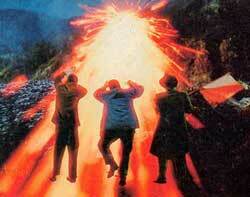 -- 'The Ray Harryhausen UFO Effect: Earth vs. the Flying Saucers,' by Jack Hagerty, FILMFAX #105. Detailed look behind the classic invasion. -- 'The Making of Captain Clegg (aka Night Creatures),' by Bruce G. Hallenbeck, LITTLE SHOPPE OF HORRORS #17. On the set with Cushing and others behind the Hammer classic. -- 'The Ferociously Compelling Barbara Steele in Nightmare Castle,' by David J. Hogan, MIDNIGHT MARQUEE #73/74. Shows how a minor film is deeper than we might think. -- 'Don't Open the Coffin: A Baby Boomer's Adventure in the Land of Dark Shadows,' by Rod Labbe, SCARY MONSTERS #55. An extensive look back at the horror soap, including numerous sidebars and cast interviews. -- '24 Monsters Per Second: The DVD Voyage of Ray Harryhausen,' by Charlie Largent, VIDEO WATCHDOG #115. Detailed look at how Harryhausen has fared on DVD. -- 'Shades of Renfield: Ten Buzzing Performances,' by Tim Lucas, VIDEO WATCHDOG #121. The author of The Book of Renfield reveals his favorite fly-eaters. -- 'The Mystery of Lionel Atwill: An Interview with the Son of the Late Great Horror Star,' by Greg Mank, MONSTERS FROM THE VAULT #20. First interview with Anthony Atwill about his father, growing up in Hollywood, and the legacy of horror. -- 'Monstrous Musicals,' by Alvin H. Marill, SCARLET STREET #53. Unique survey of musical versions of the classic monsters, both famous and obscure. -- 'Algol,' by Henry Nicollela, VAN HELSING'S JOURNAL #6. Analyzes the forgotten German silent fiction film. 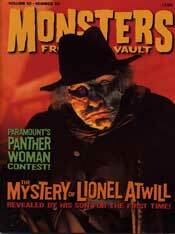 -- 'The Panther Women of the Island of Lost Souls,' by Gary Don Rhodes, MONSTERS FROM THE VAULT #20. Reveals the orchestration behind a nationwide search for an actress to play the savage love interest onscreen. -- 'Triffids on the March: from John Wyndham to the BBC,' by David J. Schow, VIDEO WATCHDOG #120. Everything you need to know about the murderous walking plants. 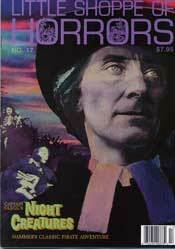 -- 'Frank Strayer: Poverty Row's Dark Director,' by Kenny Strong, MIDNIGHT MARQUEE #73/74. The man behind some of Hollywood's least regarded films. 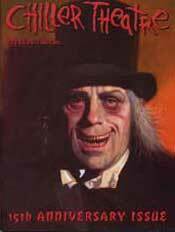 -- 'The Horrific Cinema Heritage of Dr. Jekyll and Mr. Hyde, Part 2,' by Tom Triman, JOURNAL OF FRANKENSTEIN #7. From film to radio and television, Hyde in all his transformations. -- 'War Correspondent,' by Bill Warren, STARLOG #336. Interviews David Koepp, screenwriter of War of the Worlds, who explains how much of the Spielberg film derived from Wells' novel. -- 'Justice -- Lost in Space?,' by Tom Weaver, MONSTERS FROM THE VAULT #20. Traces Ib Melchior's battle with Irwin Allen over who came up with the real Space Family Robinson. -- 'Character King Brad Dourif: From Cuckoo's Nest to Seed of Chucky,' by Scott Voisin, VIDEOSCOPE #55 Career-spanning interview, including Deadwood. -- Dr. Gangrene's Chiller Theater Live! at WonderFest includes a surprise -- and historic -- visit from Bob Burns dressed again in his Tracey the Gorilla suit. -- Frankenswine Trilogy by Brian Nichols and his fabulous Ghoul Girls (who look suspiciously like his daughters! ), is screened at the Monster Bash. -- Godzilla: Final Wars is screened to more than a thousand fans at G-Fest. -- Standing ovation for first-ever Nightmare on Elm Street cast reunion, at Monster-Mania 4. -- 30th Anniversary Presentation of Rocky Horror Picture Show, at the Hollywood Bowl, the largest gathering ever to see the film. 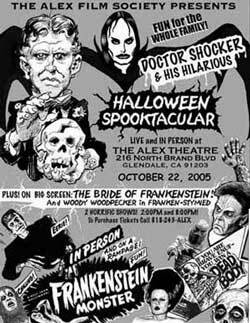 -- Dan Roebuck revives the Spook Show, bringing Doctor Shocker and his Hilarious Halloween Spooktacular to a theater in Glendale, Calif.
-- Dead Elvi joined by Bobby Boris Pickett and Zacherley for 'Monster Mash' at Chiller Convention. -- First cut of horror take-off, Terror in the Tropics, is screened to fans at Fanex 18 in Baltimore. -- MARIO BAVA Original Soundtrack Anthology Vol. 1 and 2.
the Creeping Cruds. Horror rock from Nashville, includes Dr. Gangrene intro. -- JEFF WAYNE'S MUSICAL VERSION OF THE WAR OF THE WORLDS, deluxe set. reviews lifted from online websites. freeze up on some DVD players. Collection' even though he stars or co-stars in four of the five films. -- Going bats! National Film Museum's 'restored' VAMPIRE BAT, shown on TCM, found to contain inserts from another movie. WOLF MAN? Gil Perkins? Eddie Parker? Or both? -- MGM: What will follow Midnight Movies? -- Universal: Repackaging the classics. -- VCI: Targets classics and obscure serials. -- Warner Bros: Brought us Kong, box sets. Who did the best work in 2005 to advance the state of classic horror research. Write-ins only. Who deserves to be named 'Monster Kid of the Year' for efforts beyond the call of duty to build a better world of gods and monsters? (Recent winner: Arnold Kunert, who got Ray Harryhausen his star on Hollywood Walk of Fame, and Larry Blamire, the mad scientist behind THE LOST SKELETON OF CADAVRA). Already inducted are: Bob and Kathy Burns, Forrest J Ackerman and James Warren, Zacherley and Vampira, Ray Harryhausen, Ray Bradbury, Alex and Richard Gordon, William K. Everson and Rick Baker. Again, to vote: Type your picks, or cut-and-paste the ballot, and email to taraco@aol.com by Feb. 18, 2006.